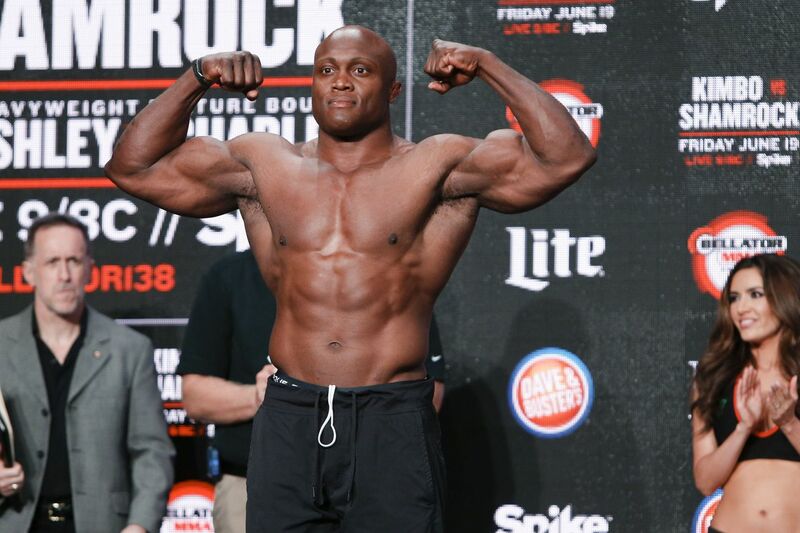 When most top fighters are reaching their peak in camp, Bobby Lashley, who meets Josh Appelt in Bellator’s co-main event on Friday night’s Spike TV event from Memphis, was busy doing something completely different in his second job as a pro wrestler. Lashley (14-2) was once being groomed by Vince McMahon to be the next big star in pro wrestling nearly a decade ago, in what now seems like a surreal lifetime ago. His big push was being managed by Donald Trump in the “Battle of the Billionaires” WrestleMania match in 2007 where the loser of the bet between Trump or Vince McMahon (represented by another wrestler, Umaga, who passed away many years ago), would get their head shaved bald. While McMahon controlled the script, Trump was never going to let his head be shaved and the outcome was obvious. Still, the show drew the most pay-per-view buys, 1,250,000, of any non-boxing event in history up to that point in time. Lashley won, and Trump escaped with his unique hair intact.